Dr Kaberi Gayen, University of Dhaka presented on the importance of understanding the social networks and the links, roles between network actors. Social network analysis holds tremendous potential for understanding the connectedness of individuals and groups. It has applications among others for the organisation of health care, in the business sector, politics, public health and terror prevention. Dr Gayen provided examples from her own research in the area of contraception use in rural communities in Bangladesh, drug misuse in urban Dhaka, and.employment search among older workers in Scotland. Listen to Dr Kaberi’s presentation here. SDHI will host a Workshop on Social Network Analysis in the new year. Invited speaker will be Professor of Applied Statistics Robert Raeside, Edinburgh Napier University. Cardiovascular disease (CVD) is the second most common cause of death among people with learning disabilities (LD), and lifestyle has been found linked to various risk factors. With increasing emphasis on self care and management and and a shift in responsibility for illness prevention it is of critical importance how people with LD can be involved in decision making processes. The paper by Young, Naji and Kroll that was published online in Family Practice this month reports on findings from a qualitative study with service users, health professionals and carers. Today, we are launching Social Dimensions News Digest. 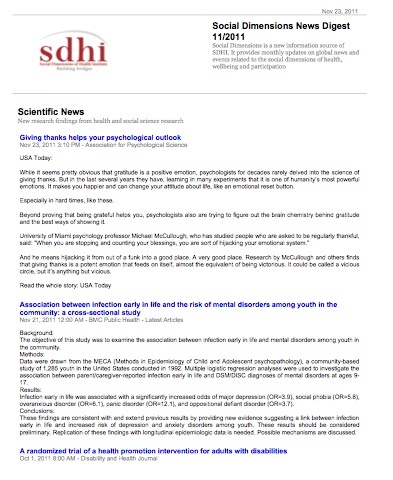 In addition to Twitter, Facebook and our Newsblog, SDHI will occasionally publish this bulletin of selected news items, scientific developments and local events. We will shape this electronic publication as we go along. The next edition will be landing in your e-mail inbox if you are on our mailing list. If you are not yet receiving information from us, please contact us at http://www.sdhi.ac.uk and we gladly add you to our mailing list. Come and join us for an exciting seminar by Dr Kaberi Gayen, Associate Professor, Department of Mass Communication and Journalism at the University of Dhaka, Bangladesh. to attribute data are those of variable analysis, whereby attributes are measured as values of particular variables (income, occupation, education etc.). Here an alternative is forwarded that of the contacts, ties and links, the group attachments and meetings, which relate one agent to another and so cannot be reduced to the properties of the individual agents themselves. Relations are not the properties of agents, but of systems of agents; these relations connect pairs of agents into larger relational systems. The methods appropriate to relational data are those of network analysis, whereby the relations are treated as ex- pressing the linkages which run between agents. This allows the position of the person (actor) in their social web to be represented and can take account on the influences on that individual emanating from those whom they are connected with. In this presentation the application of this approach is exemplified by, mainly, a re- search conducted on women in sampled villages in rural Bangladesh. The purpose of the research was to understand the nature of the influences on the likelihood of using contraception and in accessing professional care facilities. In this presentation the whole processes of the investigation is presented. This allows one to more effectively understand how peer-pressure and local economic change influences the individual both directly and through their web of contacts. From this frame of analysis it is shown that not being in a central position leaves one more exposed to missing key health information. Another important out- come is to demonstrate how strata in society might accelerate change or impede change. Examples have been drawn also from a recent research on drug users of slums in Dhaka city and the social networks of older workers in Edinburgh local job market. Dr Kaberi Gayen is an Associate Professor in the Department of Mass Communication and Journalism in the Social Science Faculty of Dhaka University, Bangladesh. She obtained her PhD, Modelling Influences of Communication on the Fertility Behaviour of Women in Rural Bangladesh, from Edinburgh Napier University in 2004. Then she pursued her EU-funded Post-doctoral research, Social Networks of Older Workers, in the same university from 2004-2007. In both her PhD and Post-doctoral research, she performed extensive fieldworks to understand the influence of social web on human behaviour. She returned to Bangladesh in 2007 to join Dhaka University and the subjects she teaches there include Advanced Mass Media Research and Cultural Analysis, and Communication and Gender. She published considerably in the area of Social Network Analysis, Analysis of Social Capital, and Gender Studies. Her published book is Modelling Influences of Communication (2009), Construction of Femininity in the War Films of Bangladesh (2012, forth coming). Gayen, T., Gayen, K., Raeside, R. and Lawrie, E. 2011. “Cohesive Subgroups and Drug User Networks in Dhaka City, Bangladesh”. Global Public Health. DOI: 10.1080/17441692.2011.573800. Pp. 1-21. Gayen, K. and R. Raeside. 2010. “Social Networks and Contraception Practice in Rural Bangladesh”, So- cial Science and Medicine. 71(9): 1584-1592. Gayen, K. and R. Raeside. 2010. “Communicative Actions, Women’s Degree of Social Connected- ness and Child Mortality in Rural Bangladesh”, Child: Care, Health & Development. 36(6): 827-834. Gayen, K. and R. Raeside. 2007. “Social Networks, Normative Influence and Health Delivery in Rural Bangladesh”. Social Science and Medicine 65 (5 September): 900-914. Gayen, K., R. Raeside and R. W. McQuaid. 2010. “Social Networks, Age Cohort and Employment”, Inter- national Journal of Sociology and Social Policy. 30 (5/6): 219-238. Elliott, L., Raeside, R., Gayen, K., and Janett, Pow. 2011. “Understanding Complex Interactions using So- cial Network Analysis”, Journal of Clinical Nursing. (In Press). 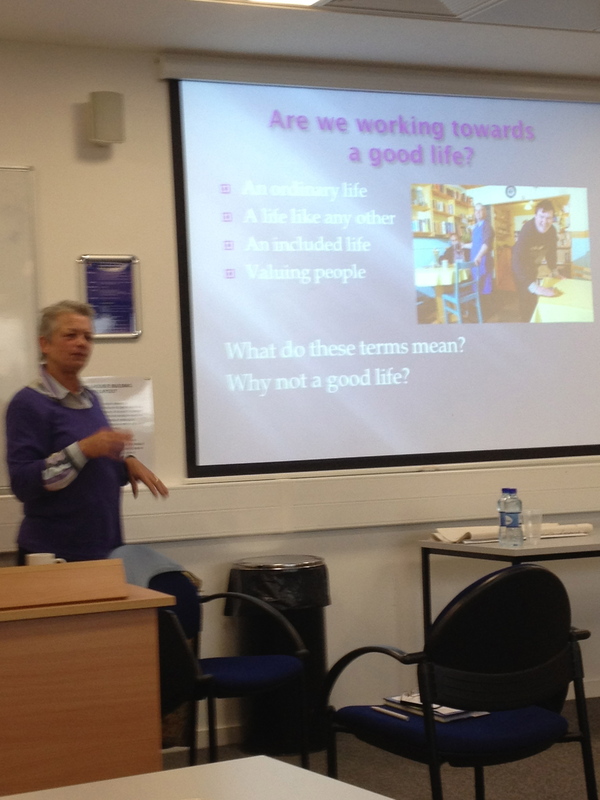 Jan Walmsley presented thoughts, analyses and experiences about what ‘a good life’ means to people with learning disabilities in conjunction with her recent book ‘People with Intellectual Disabilities: Towards a Good Life?’, which she co-authored with Kelley Johnson and Marie Wolfe (2010) at today’s SDHI seminar. As reported earlier, the SDHI team had a strong presence at the 139th Annual Meeting and Exposition of the APHA, entitled ‘Healthy Communities Promote Healthy Minds and Bodies’ in Washington DC. Details of this year’s program can be found here http://apha.confex.com/apha/139am/webprogram/start.html The Conference was attended by over 13,000 delegates. The meeting has also opened up new opportunities for collaboration with various partners in the US, including the University of New Hampshire on a survey project on disability and the University of Washington on Multiple Sclerosis. Further, the meeting helped with further strengthening working partnerships with Washington University and St Louis. SDHIs pragmatic and interdisciplinary approach was in line with several presentations at this year’s APHA that stressed the importance of finding new, innovative ways of tackling health and inequality challenges. The Conference programme reflected the scope of SDHIs research and activity agenda, including sessions of emergency and disaster preparedness, violence and health, ageing, disability and rehabilitation, health promotion to name just a few. Next year, we hope for an even stronger representation of SDHI at the meeting. It is a good time to start thinking about research abstracts. The deadline for abstract submission is typically at the end of January or beginning of February. The 2012 conference will be held in San Francisco.